(Bloomberg) -- Chinese laminating film producer Kangde Xin Composite Material Group Co. fails to repay a local bond due Tuesday, which could trigger cross-default on its dollar note. The firm cited liquidity crunch for not being able to repay the principal and the interest on the 1 billion yuan bond ($148 million), according to a public filing on Tuesday. The default follows the Jiangsu-based firm’s warning on Monday that it sees uncertainty in repayment of its 1 billion note as well as another 500 million bond due Jan. 21. Chinese local bond failures surged to a record 119.6 billion yuan last year, more than quadruple the tally in 2017, according to Bloomberg-compiled data, as slowing growth in the world’s second-biggest economy and a deleveraging drive drained liquidity. Chinese President Xi Jinping in November repeated "unwavering" support for the private economy and pledged more measures such as tax cuts and financial support. 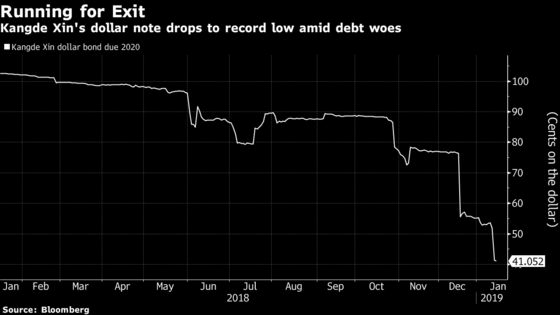 The missed payment could lead to default on its $300 million dollar note, which may become the first dollar bond failure from a Chinese company this year. A Chinese local government will coordinate policy and funding arrangement to ensure stable operation at a unit of Kangde Xin Composite Material Group, people familiar with the matter told Bloomberg citing a notice sent by the unit. There is no grace period for the two local bonds due this month, according to their bond prospectuses. The firm has 3.5 billion yuan of local bonds outstanding and the $300 million note due 2020, according to data compiled by Bloomberg. According to the offering memorandum of the 2020 dollar note, a cross-default will be triggered if the company’s parent guarantor or any restricted subsidiary fails to make principal amount of $20 million or more when due. Its credit rating was downgraded on Monday to CC from BBB by Shanghai Brilliance Credit Rating & Investors Service Co., according to a filling on Shanghai Clearing House. Fitch Ratings last month cut Kangde’s credit rating by two notches to B+, after regulators in China found that the company failed to adequately disclose information about dealings of its largest shareholder and worsening financial situation. “Kangde Xin is a private company and there is no major contagion that a LGFV or SOE default would bring, but is another warning to the vulnerability of single-B investors,” said Owen Gallimore, head of credit strategy at Australia & New Zealand Banking Group Ltd.